I met one of my neighbours at the community mail boxes that are now standard across the country. He lives up the street from me and I drive by his house every day to get to my humble abode. “How’s the Infiniti treating you these days?” I asked, genuinely interested but also concerned that I had suddenly reached my limit for small talk topics off the bat. 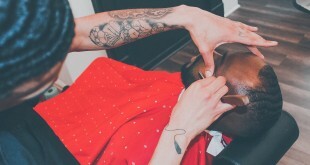 “Oh it’s gone. I got a new car, just picked it up a few hours ago!” he replied. My neighbour used to own an Infiniti JX35, now known as the QX60. I asked him what he got as a replacement to which he suggested I come with him to take a look for myself, all while semi-annoyingly begging me to guess his new car the whole way there. A short walk later, I could see it in the driveway and recognized it immediately. “Wow, really?” I proclaimed a bit dumbfounded. 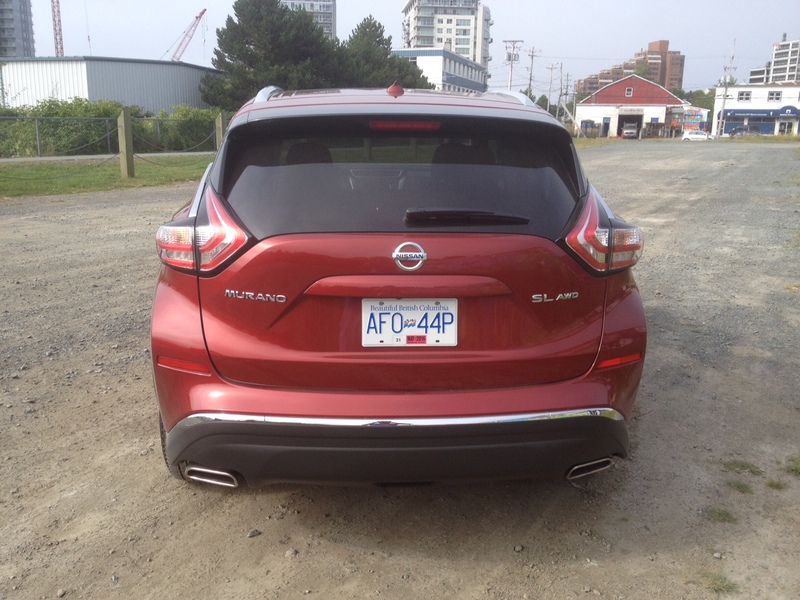 As it turns out it was a 2015 Nissan Murano. “I have one of those as a tester this week!” I said perhaps a little too excited at the coincidence. He opted for the highest trim level possible, the Platinum edition. The version I was tasked with reviewing was the SL, which is one trim down from the Platinum. When I asked what made him switch he said he was having his JX35 serviced at the dealership and took the new Murano out for a spin, mostly to kill time. He ended up buying it a few days later. He claimed that the Murano’s luxury and drive was just as good as the Infiniti’s and he actually liked the styling much better. 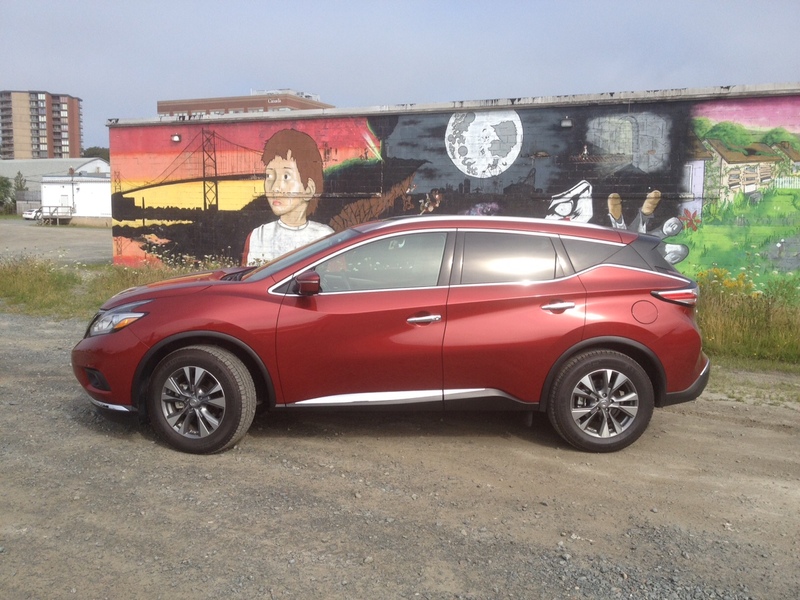 Speaking of the exterior styling, the Murano has always been one to try to stand out from a crowded parking lot. Since it first debuted in 2003, its controversial styling laid the foundation for Nissan to take the name approach with other models including the Cube (no longer sold on our shores) and the JUKE. 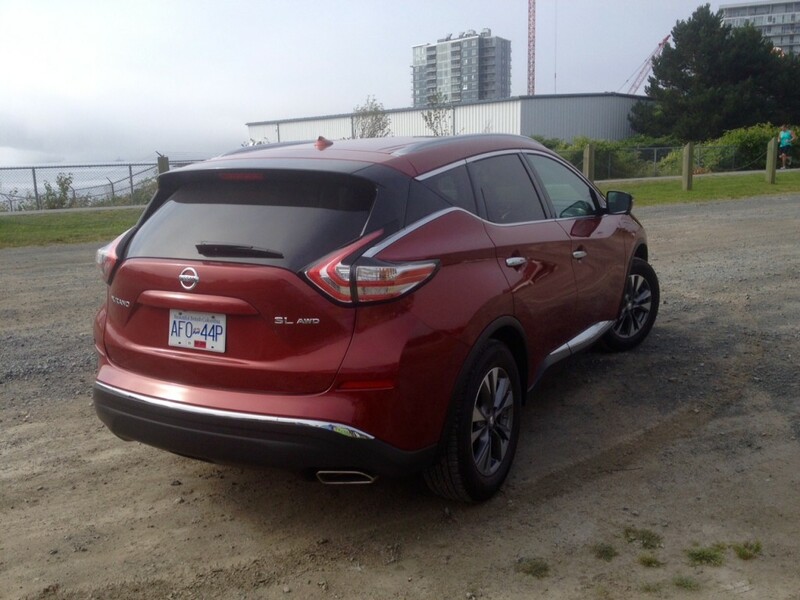 One of my colleagues who had the Murano tester before I did referred to the all-new 2015 Murano as “ugly”. I can’t say I agree. 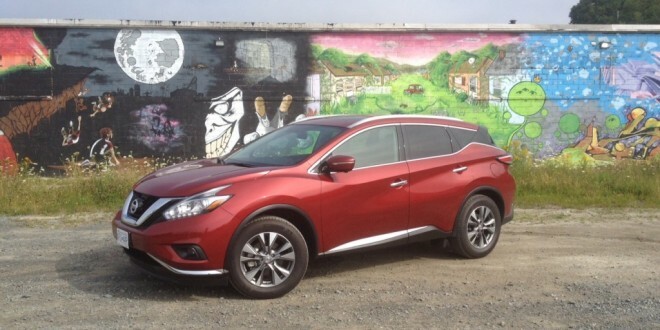 Its unusual lines and stretched out proportions make it decidedly Murano, and indeed, decidedly Nissan. The front grille is likely the part that sticks out most. 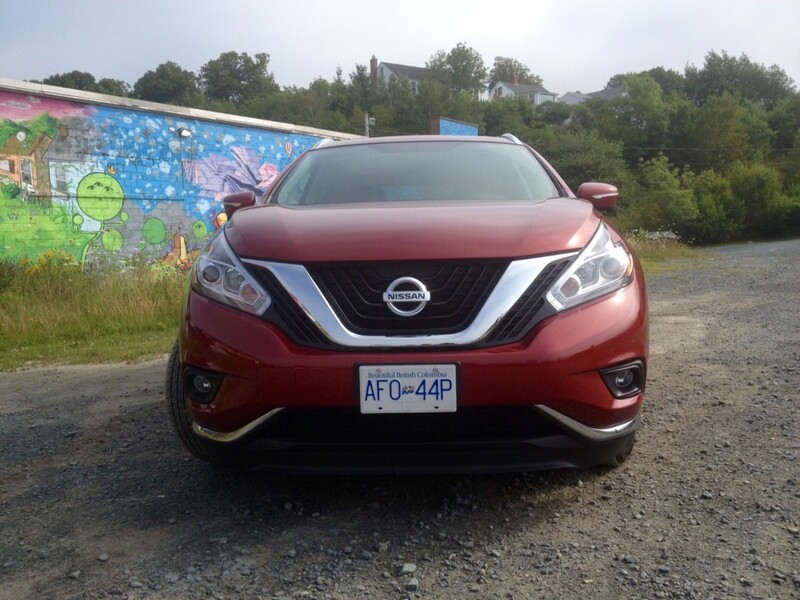 Wearing the corporate chrome boomerang, which is the largest iteration I’ve seen yet on a Nissan, matched with a grille that acts a bit like its shadow plus swept back head lights that sport matching boomerang LED daytime running lights, the Murano certainly can’t be called boring. The swoopy lines continue down the side profile and this is wear Nissan is showing off its latest magic trick: the floating roof down by the d-pillar. This is going to be the latest trend in the auto industry since LED lighting, mark my words. The rear is finished by boomerang shaped tail lights which remind me a bit of strawberry ice cream. While the wheel design is fine, you can only get a different style on the Platinum edition. 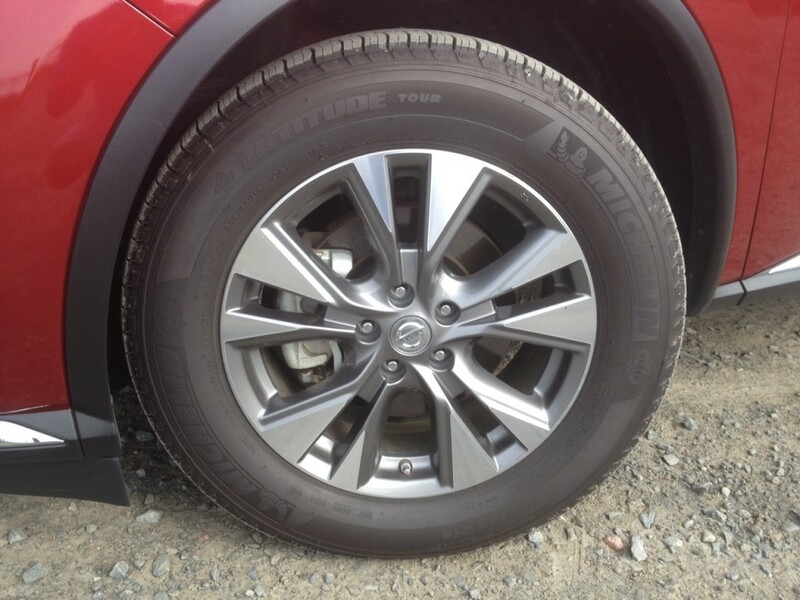 Otherwise every trim gets the same wheels. Overall, I like the design a lot. It looks premium. Inside looks premium as well. But perhaps more importantly everything feels premium too. The large touchscreen matched against a glossy piano black finish not only looks good but it works splendidly. I wouldn’t go as far as saying it is the best in the business, but Nissan does a good job of making everything fairly straight forward. It doesn’t take long to get used to. The instrument cluster also gives you a 7-inch screen housed in between the speedometer and odometer. 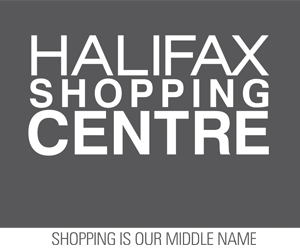 You can cycle through different menu options such as fuel consumption ratings to what’s playing on the radio. The screen is clear and easy to read, though fiddling around with it too much does take your eyes off the road for longer than they should be. Back to that premium word again though. When you park your keister on either of the front seats, there’s an almost immediate feeling of comfort. A lot of this has to do with Nissan’s use of ‘zero gravity seats’, an idea inspired by NASA technology. With the exception of Volvo seats, they are easily among the most comfortable seats in the business. Even better news is the fact that head room, shoulder room and leg room are in abundance both up front and out back. Cargo room is decent, however this is an area where the Murano is outdone by a few of its competitors which offer more space. 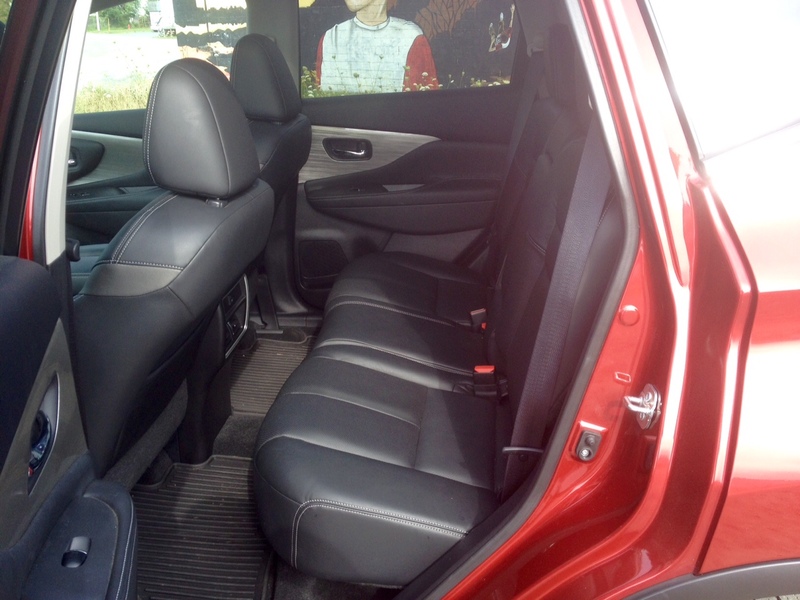 The rear seats do fold offering more space however. 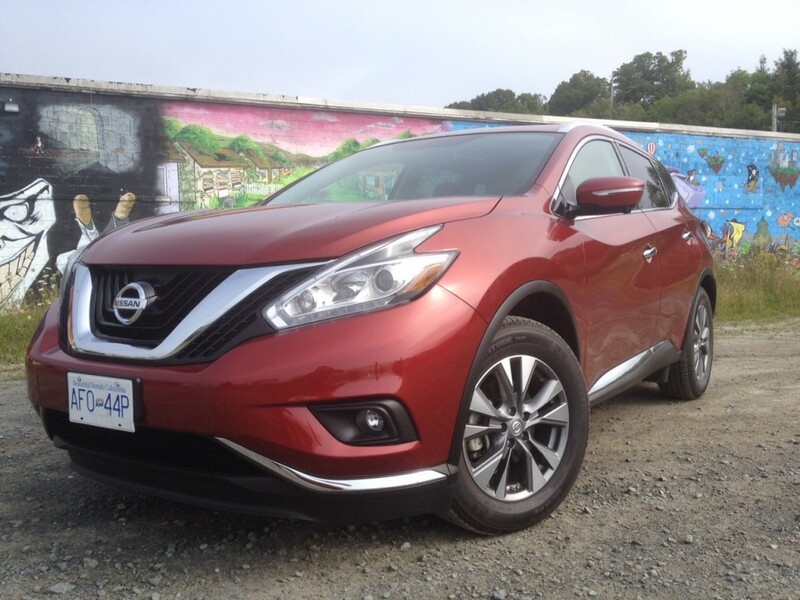 The Murano gets just one engine choice and it comes in the form of a 3.5 litre V6 producing 260 horsepower and 240 pound feet of torque matched to a continuously variable transmission (CVT). 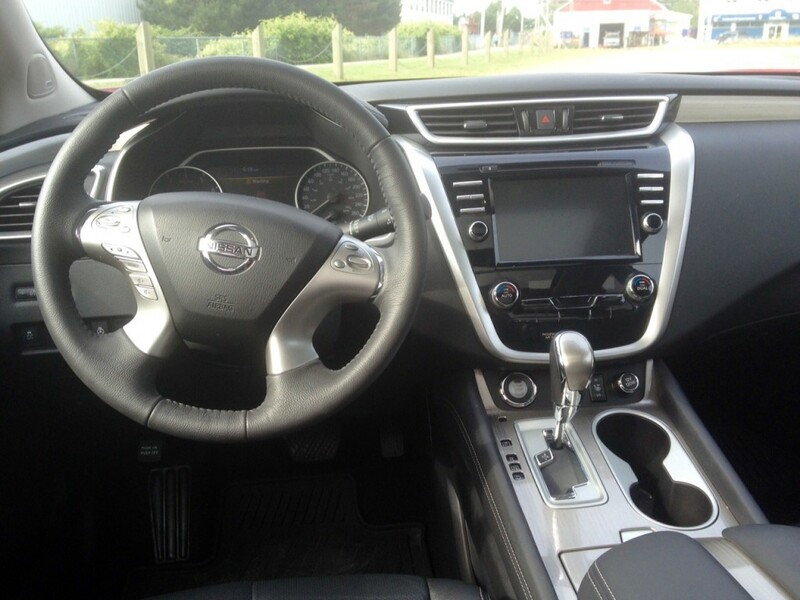 Nissan has been using CVT’s in most of its product for years now and despite the transmission getting a bad reputation by car guys and gals, Nissan probably makes among the best CVT’s in the business (though Honda and Subaru have been giving Nissan a run for its money lately). In this particular case, the CVT works splendidly with the V6. It’s not all that intrusive when you are looking to make use of all those 260 horses and it isn’t annoying intrusive to the cabin either. I would dare to even call it smooth. You can shift gears manually, but I’m not sure who would be doing this since the gears are simulated and you won’t be winning any drag races anyway. That’s not to say the Murano is slow, in fact low-end power is really quite good, but sporty driving doesn’t make much sense in a vehicle like this. That’s perhaps why the ride is tuned to feel more like an Infiniti than anything else. On top of that, the steering seems to be weighted a bit more on the firmer side, even though it doesn’t necessarily translate into a direct feel to the driver, but it’s not as light and numb as its competitors. 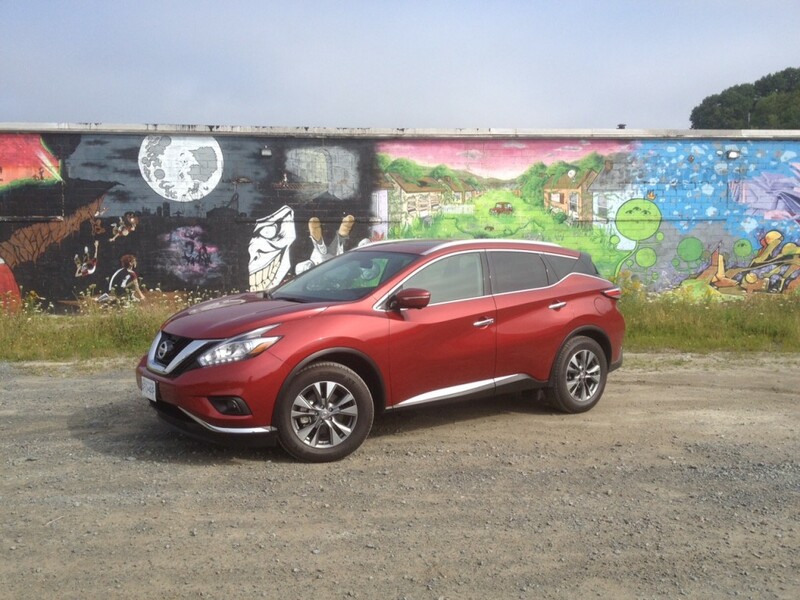 The Murano is quite at home on city streets as a result of the comfortable ride and decently weighted steering wheel. And if you were to spend most or all your time driving, you’ll return 11 L/100 kms if Nissan is to be believed. 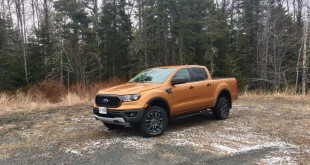 I tend to believe things I see and experience for myself, so a more realistic number is the one I returned in real world driving: 13.5 L/100 kms in mostly city driving. Nissan claims an 8.2 L/100 kms rating on the highway. Those numbers are acceptable for a vehicle in this class and they are another reason why you can actually thank the CVT for being so good. The Murano itself is so good too. In fact, I now understand why my neighbour may have wanted to trade down for one. He may be trading down in terms of badge prestige but really he’s trading laterally from the Infiniti brand. This is the first Nissan I’ve driven that I can confidently say has the same problem that the Lexus RX has: the Toyota Highlander is just as good. So why not save yourself thousands of dollars and get the same premium feel, features, style and comfort that you would get in an Infiniti? 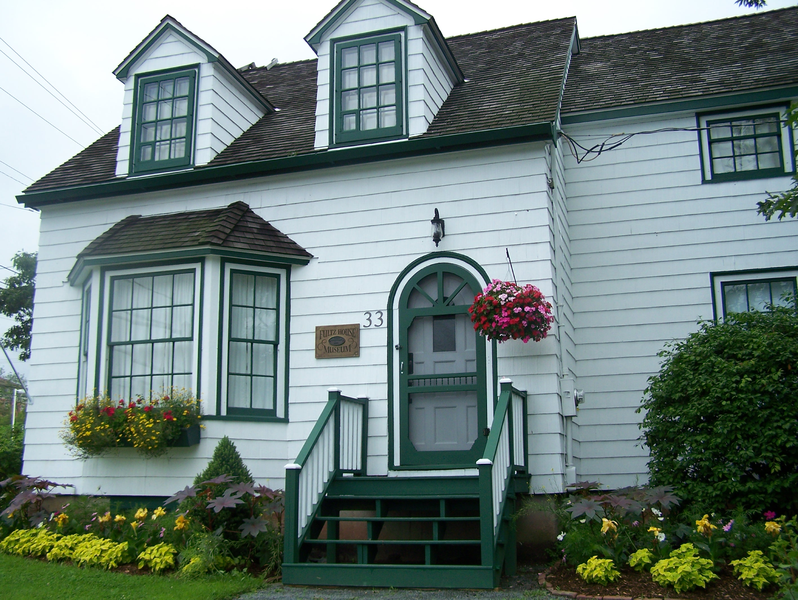 Multiple charges laid in assault incident, Beechville, N.S.